Michael R. Oldham (b. 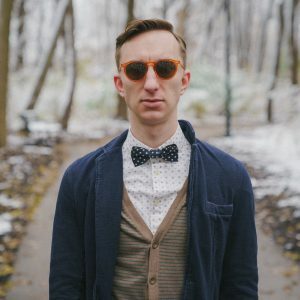 1989 Braidwood, IL) is a composer and pianist who weaves imagery, story, and imagination into his music, with influences spanning from indie art rock, french impressionism, film music, and surrealist Americana. Music In Segments, Michael’s newest experimental work written exclusively for Instagram looping video, is available to play now. He has self-released several EPs of his music digitally, including Three Vignettes (2017), which is a work of three movements with short stories for violin and piano, The Los Angeles Miseries (2016), which is a set of pieces for solo piano on perspectives attained while driving across America from Chicago to Los Angeles, Grand Delusions on a Small Scale (2015), which features early solo piano works, as well as Fantasies for Piano (2014), which is a six-movement dissection of some of his favorite songs by artists including Fiona Apple, Dirty Projectors, My Brightest Diamond, Andrew Bird, St. Vincent, and Sufjan Stevens. Michael also penned a brand new score for Georges Méliès’ famous silent film, Le Voyage Dans La Lune from 1902. It was commissioned by the Lewis University Monarch Wind Quintet of Romeoville, Illinois, and was premiered live-to-picture (2016). His choral works have received several premieres and accolades, as well: Ceaseless and One Delusionary Loon Lands in the Pocket of the Earth (with words by performance artist and toychestral-composer-extraordinaire Alexa Dexa). Michael was mentioned as a top 30 finalist in the Oticons Faculty International Film Music Competition, as well as a nominee for the Vienna Symphonic Library’s International Film Scoring Competition. NPR Music also mentioned his solo piano piece, Phantasmagorical Religious Exercises on their Tumblr. Michael has received the Georges Delerue Memorial Scholarship award in film scoring, as well as participation in an internship with Paramount Pictures. His concert music has garnered awards from Berklee’s Contemporary Symphony Orchestra Composition Competition, the Music Institute of Chicago’s Generation Next Young Composer’s Competition, the Kalistos Chamber Orchestra, as well as premieres at the New England Conservatory, the Kennedy Center, Chicago’s WFMT radio, and the Green Lake Music Festival in Green Lake, Wisconsin. Michael earned his Bachelor’s degree in Film Scoring and Composition from Berklee College of Music in Boston, Massachusetts, and studied briefly at Philippos Nakas Conservatory in Athens, Greece. He also keeps quite busy as a rehearsal and performance accompanist in and around Chicago. With a list of works spanning from larger orchestral tapestries to solo piano pieces, Michael has proven himself to be a tenacious, imaginative composer ready to transport audiences into his outlandish musical phantasmagoria.